One of the benefits of Pilates is to help ease chronic (non-specific) low back pain and aches by building strong core muscles. Most people think that pain and aches come with age, that’s true in some ways, but the most important thing is we do not have to continue putting up with them! Pilates strengthen the core muscles along the lumbar spine to stabilise trunk muscles, in particularly the transverse abdominals, to ensure correct posture and correct movement activation of the lumbar spinal muscles – failing which, will result in low back pain. First let’s understand what is Core muscles? Core is defined as muscles that surrounds the Lumbar-pelvic (spine to pelvic) region and includes the anterior (front) abdominals, the paraspinals (back spinal region) and posterior gluteal (buttocks), the front pelvic floor muscles, the hip abductors and lateral rotators, and superior diaphragm (below ribs). 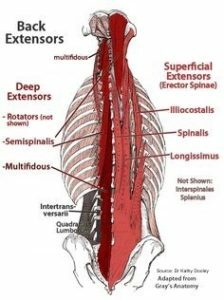 All these muscles have direct or indirect attachments to the extensive thoracolumbar connective tissues and spinal column (Bliss & Teeple, 2005). Any exercise that involves the use of your abdominal and back muscles in coordinated fashion counts as a core exercise. Hence, Core exercises train the muscles in your pelvis, lower back, hips and abdomen to work in harmony. This leads to better balance, coordination and stability, whether on the playing field or in daily activities (pretty much every time we move!). In fact, most sports and other physical activities depend on stable core muscles. That’s why the core is often called the “powerhouse”. Low back pain (LBP) is the most prevalent musculoskeletal conditions and one of the most common causes of disability. Non-specific low back pain (NSLBP) is defined as pain and discomfort localized below the ribs and above the lower gluteal (buttocks) not attributed by known specific diseases (Koes, Sanders, & Tuut, 2004). Mobility of spine and hips are shown to be significantly limited in back pain subjects. Hamstrings tightness and low back flexibility have also been associated with low back pain. Many factors have been contributed to acute non-specific lower back pain, including incorrect activation and force of the erector spine muscles, strength imbalance of the trunk muscles, and overall decrease in trunk muscle strength. The Pilates exercise method centers on core stability, posture, breathing, flexibility, strength, and muscle control, and could offer a postural approach focuses on active awareness of the use of trunk muscles to stabilize the pelvic – lumbar (spinal) region together with the precision and control of movement, breathing and sensory feedback could facilitate activation of the core better. Pilates reduces non-specific back pain and improve balance after 14 weeks. In a randomized controlled clinical trial, middle-aged individuals with non-specific low back pain were shown to have reduced low back pain very significantly (99% confidence level) than the Control group using Oswestry Disability Index (ODI) after 14 weeks of thrice weekly of hourly sessions of Pilates training program (Patti et al., 2016). ODI test is considered the “Gold standard” of low back functional measures, comprising of pain intensity and functional abilities centered on usage of back e.g. walking, lifting (Fairbank & Pynsent, 2000). Subjects are individuals who have been diagnosed with non-specific low back pain for more than 12 months. The Pilates and Control groups were comparable in age and relevant physical characteristics, e.g. height, weight. Subjects in the Pilates group participated in the 14-week program without the use of painkillers (nonsteroidal anti-inflammatory medications while subjects in the Control Group conducted were not actively monitored, continuing their own social activities and usual treatment, including the use of painkillers. Subjects also showed very significant improvement at 99% confidence level in balance before and after 14-week program of Pilates exercises using posturography, a computer diagnostic testing using hearing, sensory and vision inputs. There was no significant difference before and after in posturography measurements for the Control group. Pilates reduces non-specific back pain by 20% and improve balance and flexibility after 8 weeks. In a separate study by Valenza et al, an 8-week Pilates exercise program was shown to be effective in reduction of chronic non-specific low back pain by 20% (clinically relevant) and balance as well. The study also measured flexibility and the Pilates group showed significant improvement in flexibility as compared to Control group. There was no significant difference in the before and after measurement results for Control group (Valenza et al., 2017). Subjects allocated to the Pilates group underwent a Pilates exercise program twice a week for 8 consecutive weeks. Each session lasted 45 minutes. All exercises progressed at 3 difficulty levels: basic, intermediate and advanced. Both Pilates group and Control group also exhibited similar characteristics, and were aged between 18 to 70 yr old. Roland Morris Questionnaire (Stratford & Riddle, 2016) and Oswestry Disability Index were used to assess disability score. Non-specific low back pain does not only affect the mature population, in fact, the overall risk to young adults in school age is similar to adults with prevalence rates as high as 70-80% (Delitto et al., 2012). Critically, young adults tend to be more affected by non-specific low back pain than older adults. In presence of low back pain, we often modify our posture by stiffening our body by using the ankles more, with an increased feet-forward preparation to lessen hip and back in anticipation of pain. These posture defects began within first three months of the onset of low back pain but can remain in young adults even after the low pain has resolved, which of course further increase the low-back re-injury (Silva et al., 2016). Pilates immediately induces a clinical improvement of pain in 48% of young adult subjects for non-specific back pain and significantly improve posture control and dynamic balance in young adults. In a study by Lopes et al on young adults (average age 23 yr old) with non-specific low pack pain lasting at least 12 weeks, there was significant improvement immediately after Pilates exercises on postural sway and dynamic balance with non-specific back pain than the Control group. 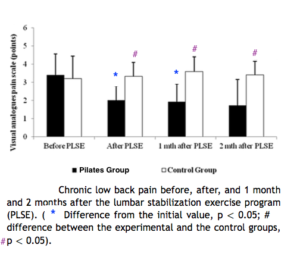 Low back pain also decreased significantly (clinically relevant) vs Control group after a single session of Pilates exercises. The postural control was evaluated using a dynamic postural control task, the Star Excursion Balance Test (SEBT), and the assessment of postural sway using a force platform. The SEBT is a simple, reliable and valid method of dynamic performance (Gribble, Hertel, & Plisky, 2012). The Oswestry Disability Index was used to quantify disability for low back pain. The Pilates session lasted 20 min and consisted on four Pilates exercises: single leg stretch (level 1), pelvic press (level 1), swimming (level 1) and kneeling opposite arm and leg reach. Reformer Pilates or Mat Pilates is more effective for chronic low back pain? In a 12-week study done by Cruz-Diaz et al on 98 adults (age 18-50) with chronic non-specific low back pain, both Reformer Pilates and Mat Pilates are both effective in the improvement of transverse abdominal activation (TrA) in patients with associate improvement on pain. Significant differences were observed after 12 weeks between Reformer Plates and Mat Pilates, suggesting faster improvement in Reformer Pilates in the short term. The improvement in transverse abdominal activation ratio after 12 weeks were observed in both Pilates groups, with +42% in the Mat-Pilates group and +52% in the Reformer Pilates, but no significant differences in Control Group. The results support the importance of a proper activation of transverse abdominals in (spinal) lumbar-pelvic stabilization and its relationship with chronic low back pain. How long does the trunk strength improvement and pain reduction period last after Pilates? In a randomized control study done by Kliziene et al, female subjects with chronic low back pain underwent 16-week of Pilates program with 10 exercises often used to improve spinal stability (Kliziene et al., 2017). The women had been suffering from chronic low back pain for at least 3 months. 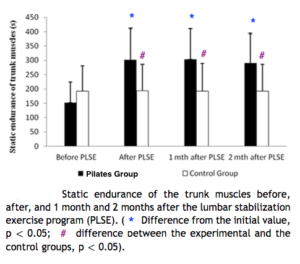 For the Pilates group, the improvement made for trunk extension / flexion strength, trunk endurance and back muscle endurance post 2 months from the end of the Pilates exercise program was found to be still significantly improved at 95% significance level compared to pre-results and also compared to Control group. Pilates builds strong core, particularly the transverse abdominals, that helps eases back aches and pain. We do not have to live with chronic pain, and yes, pain comes but does not necessary stay with age! Contact The Pilates Work team to help with your low back pain. Fairbank, J. C., & Pynsent, P. B. (2000). The Oswestry Disability Index (0362-2436 (Print)0362-2436). Gribble, P. A., Hertel, J., & Plisky, P. (2012). Using the Star Excursion Balance Test to Assess Dynamic Postural-Control Deficits and Outcomes in Lower Extremity Injury: A Literature and Systematic Review. J Athl Train, 47(3), 339-357. Kliziene, I., Sipaviciene, S., Vilkiene, J., Astrauskiene, A., Cibulskas, G., Klizas, S., & Cizauskas, G. (2017). Effects of a 16-week Pilates exercises training program for isometric trunk extension and flexion strength. Journal of Bodywork and Movement Therapies, 21(1), 124-132. Koes, B. W., Sanders, R. J., & Tuut, M. K. (2004). The Dutch Institute for Health Care Improvement (CBO) guideline for the diagnosis and treatment of aspecific acute and chronic low back complaints. Nederlands Tijdschrift voor Geneeskunde, 148(7), 310-314. Stratford, P. W., & Riddle, D. L. (2016). A Roland Morris Disability Questionnaire Target Value to Distinguish between Functional and Dysfunctional States in People with Low Back Pain. Physiotherapy Canada, 68, 29-35.